Over the past weekend, I held a dinner to mark the end of the fortnight-celebration that brought in the Lunar New Year. Being the Year of the Dragon, it is considered a very auspicious year, and it is my oldest brother “anniversary”. This year, the Lunar New Year commenced so close to the Gregorian New Year that I could not get myself ready in time to have a dinner gathering at the end of January – all I could muster then was a quick meal of 3 dishes with a couple of friends on the eve of the New Year. The New Year celebration is a time for family members to travel back to the family home in order to spend time together. The Reunion Dinner, as it is known, is held on the eve, and it is considered imperative that all members are present at the dinning table for such meal. With half of my family members living in Australia and the other half on the West coast, Midwest, and I on the East coast, such gathering is close to impossible with our busy lives, let alone the long distance in between my siblings and parents. The last time our whole family came together for the celebration was just before I left home for high school in England when I was just 13 years old. For the meal, I decided to prepare a few of my grandmothers’ Nyonya dishes. Nyonya is the term given to the women of the Peranakan culture, a hybrid culture that formed as a result of Chinese men migrating to tropical Southeast Asia, beginning in the 15th century, and marrying the local women folk. It can be considered the first mixed culture whose beginnings predates the arrival of the Spanish to the Americas and the formation of the Spanish mestizo culture. My grandmothers were truly amazing cooks, and I was blessed to have spent a lot of time with them in the kitchen as a child suffering from migraine headaches as a result of sun exposure – the kitchen became my refuge and daycare center. I grew up watching all food-related activities, smelling the cooking, handling all the ingredients when I was put to work, and tasting all the dishes before they ended up on the dinner table. Each nightly meal consisted of at least 8 dishes that were made from scratch, beginning from the early morning visit to the open market. Preparing dinner for a Peranakan family was always a tall-order that had no room for error – all partakers would sit down with great anticipation, high expectations, and a well-honed critical palate. As the starter for my dinner celebration, I decided to offer a Malaysian-Chinese tradition that is both unique and delectable. Yee Sung or Lo Hei is a raw fish vibrant salad that consists of pomelo (like a sweet grapefruit), apple, raw fish (which I substituted for smoked salmon), jellyfish (which I omitted as to not weird my friends out), candied fruits, different spices like cinnamon and five-spice powder, a wide variety of Chinese pickles, aromatics like Kaffir lime leaves and cilantro/coriander leaves, shaved daikon radish, shaved carrots, sliced fresh chili, peanuts and sesame seeds, fried wanton-skin strips, and topped with sauces like plum sauce and fresh lime juice – a total of 25 ingredients in all! According to Wikipedia, this dish was created in 1952 in Malaysia, and it is an adaptation of a Southern Chinese tradition in which fishermen would celebrate their catch on the 7th day of the New Year. 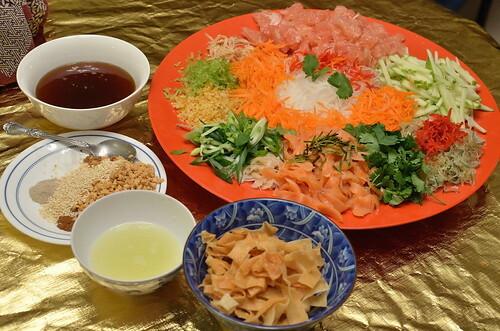 Following customary practices, all my guests gathered around the well-assembled plate of ingredients, and with their chopsticks, they tossed and mixed the different elements together while shouting out “Lo Hei” which means “Tossing Prosperity”. The idea of such vigorous act is to attract and attract the energy of prosperity and good fortune to one’s life for the year. Although foreign to my American friends, they enjoy this activity with great enthusiasm and the salad with savoring mouths, and they look forward to this interactive and playful dish at every New Year’s celebration. 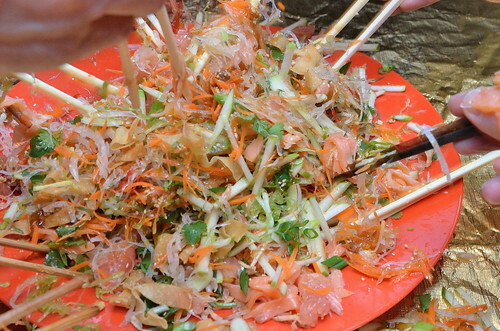 Link to History of Yee Sang/Lo Hei. Preparing the main 4 courses was quite a daunting task. If were not my local Korean grocery store, I would be running around the city trying to find the fresh ingredients that were necessary and prominent in the dishes’ flavor profile. I had spotted the pomelo for the appetizer dish a couple of weeks before hand, and I grabbed it when I saw that it was at the right level of ripeness – storing it in the fridge was necessary to preventing it from spoiling. I bought a fresh pineapple for two of the main dishes a week before, and I chose the ripest looking one and further ripened it on my kitchen counter until its scent of sweetness was oozing out of its tough skin – these were necessary steps taken by my grandmothers for assuring success in their cooking, and I was just following their finickiness for such details. I managed to find shallots, fresh lemongrass, fresh turmeric, wood fungus, beanthread noodle, coconut milk, chili paste, shrimp paste, peanut brittle, lily buds, and the various different sauces all under one roof. I love my Korean grocery store! Just preparing the spice paste for Shrimp and Pineapple in Coconut Sauce (Udang Lemak Nenas) took around an hour. 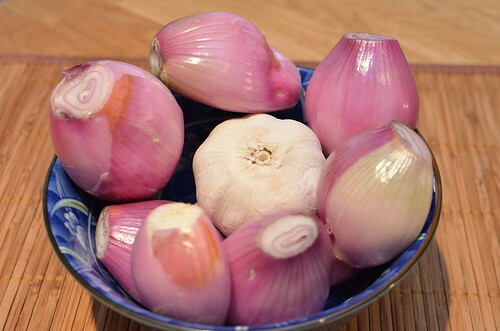 It is the main flavor base of this rather intriguing and complex dish – the list is rather long consisting of 8 roots and aromatics. 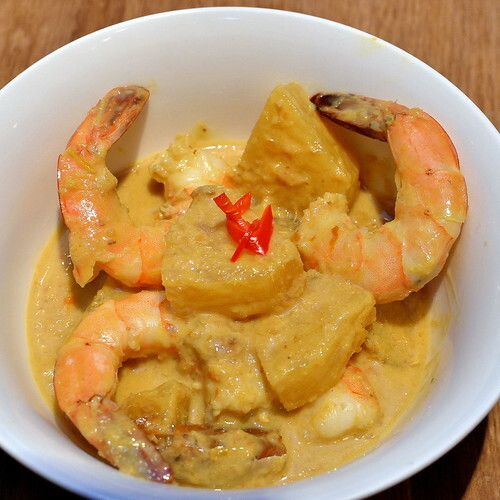 In addition to this base, the sauce is made up of coconut milk, dried fish, and tamarind juice, to which large sweet shrimp and chunks of fruity pineapple are added. As disparate shrimp and pineapple are and an unlikely pair, it is this rich and full-flavored sauce that becomes their liaison like a good matchmaker. For me, this was the most challenging dish to make due to its complexity and list of fresh spice ingredients, and due to this fact, I recreate this dish probably only once every three years. However, it was worth the effort judging by the complements that I received from my guests who savored it with gusto and satisfaction. 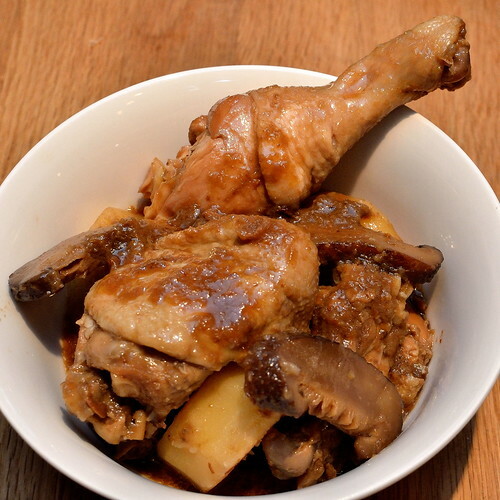 Chicken, Chinese Mushrooms, and Potato Stew (Pongteh) is one of the most recognized Nyonya dishes by those familiar with the culture. The ingredients are stewed in a sauce that consists of copious amounts of crushed shallots and garlic, which is then flavored by a brown bean paste. I had cooked the dish the night before until the chicken was about to fall of the bone, and I allowed it to soak up the savory sauce overnight. This dish is standard fare in all Peranakan home dinner tables especially during festive days. It was served with the obligatory hot sauce of chili paste, fish paste, and lime juice (Sambal Belacan); this chili mixture adds a contrasting spiking spicy citrus element to the mild-flavored chicken. The stew was well-received by many guests for its subtle yet soulful flavors. To complement the above dishes, I made a couple of side Nyonya dishes. 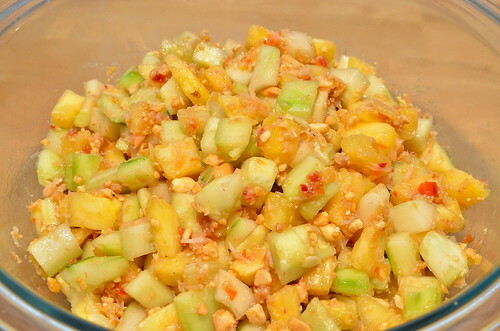 The first was a simple Cucumber and Pineapple Salad (Sambal Nenas Timun). 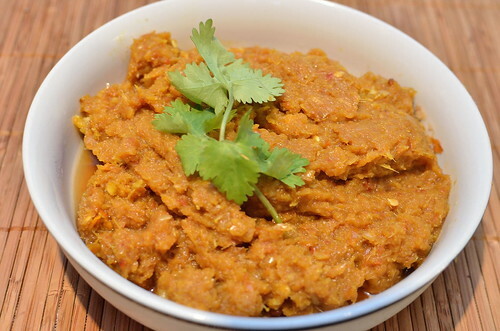 In addition to the fore mentioned ingredients, the sauce consists of chili paste, dried shrimp, salt, shrimp paste, and an odd ingredient – crushed peanut brittle. The fresh ingredients are spiced up by the chili concoction, slightly brined by the dried shrimp and shrimp paste, and the peanut brittle brings notes of rich nuttiness and caramel sweetness to the dish. I have prepared this dish often since it is quite easy to put together, and it is a favorite at many of my dinners. As usual, it did not disappoint my guests this time as there was not much leftovers at the end of the meal. 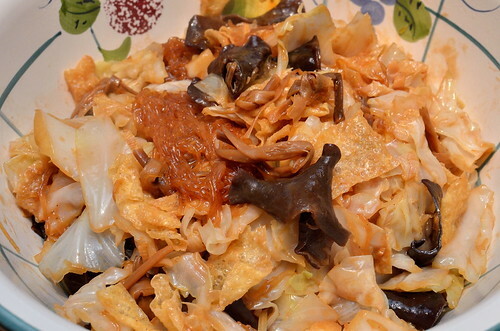 The other side dish was a melange of Cabbage, Beancurd skin, Beanthread Noodles, Lily buds, and Wood Fungus in a garlic and fermented beancurd sauce (Chap Chai). This recipe is the closest that identifies the Peranakans as Chinese immigrants, even though they are centuries removed from the motherland. The various ingredients are purely Chinese and one has to seek out these imported ingredients to make the dish successfully. Many of my guests exclaimed how much they enjoyed the dish especially the slippery and slightly crunchy wood fungus, which I found it to be odd and amusing! After such a rich and wide offering of dishes, I decided to make dessert simple – Fruit Cocktail. However, it was not just your plain old fruit cocktail but one with a Chinese and Southeast Asian twist. I opened cans of Lychee, Rambutans stuffed with Pineapple, Jackfruit, and Almond Jelly. Just as in most Asian desserts, the accompanying syrup was not cloying sweet, and there were only a few ladleful scoops left by the end of the meal. It was just the perfect ending. The end of the Lunar New Year, called Chap Goh Meh in the Peranakan culture, was an ocassion in which one used to parade an unmarried daughter to potential eligible suitors in hope of securing a well-matched marriage. The end of the fortnight was also a time to have one last festive bang before resuming daily life, hoping for a fortuitous year. I was glad that I could share my treasured grandmothers’ dishes with my close friends and continue the tradition of Lo Hei. I only wished that I had more hands in the kitchen just like how my older relatives would come together for a couple of weeks in preparation for the New Year. Perhaps I should have also thrown in a session of speed-dating for both my hopelessly single straight and gay friends, much like the Chap Goh Meh, in hope of finding them a suitor for the New Year. But, there is so much I can do for them, especially when one is cooking a monumental Peranakan dinner like this one! Maybe they should have matched me with someone special for all the effort that I put into and the dishes that my guests stuffed themselves with that night. The Peranakan saying that a young lady’s marriage worthiness is reflected by the skillfulnes of her cooking should still hold true to this day and to anyone, either female or male, as it is in my case! 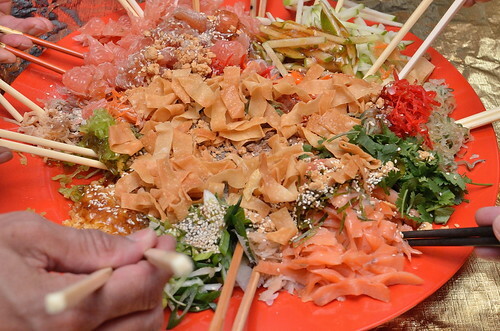 For this year’s celebration, I was out of the ingredients for the Lo Hei/Yee Sang salad featured above since I did not have the various pickles and ingredients that my mother would usually send to me during to her trips here. In lieu of that, I decided to make a dish that hails itself as the only appetizer found in the Peranakan/Nyonya cuisine – Kueh Pie Tee or fondly known as Top Hats. 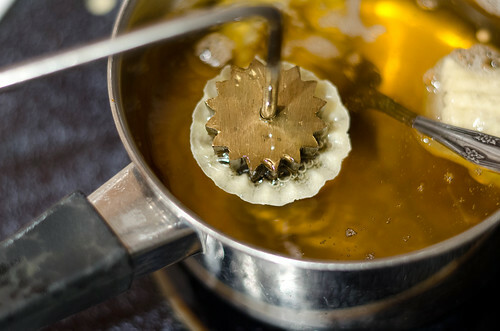 To make the shells, I needed a brass mold that I had not picked up in over 10 years. After heating it up in some hot oil, I dipped it in a pool of thin rice and flour batter, and return it into the oil to fry as the top of the shells spreaded out, hence its moniker Top Hats. I must admit that it was rather time-consuming since it took me around 2 hours to make around 45 shells, knowing that my guests would scoff down an average of three even before the main meal. As the stuffing, I had to hunt down some Jicama root, as known as Bangkuang in the Peranakan dialect. For many years, I would find them in the local Mexican stores, and this piqued my curiosity about its origin. After doing some research on Wikipedia, I discovered that the root vegetable is indigenous to Mexico, and it was brought over by the Spanish conquistadores to the Philippines, one of her colonies, before it spreaded throughout Southeast Asia. 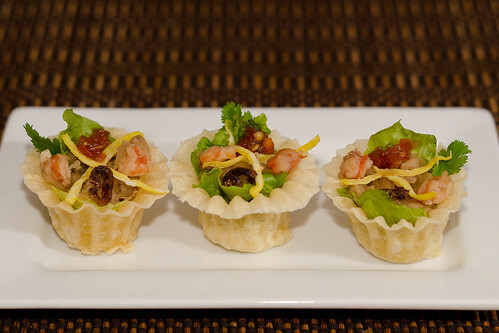 The Pie Tee stuffing consists of the shredded and dry-squeezed Jicama, diced chicken breast, and diced shrimp. What elevates these ingredients and ties them together is a sauce made from garlic, fermented bean sauce, 5-spice powder, soy sauce, and white pepper. Along with this mixture, the crispy shells are stuffed with fresh lettuce, and topped with egg strips, fried shallots, and a dap of tangy chili sauce. A single mouthful of this dish is a study of contrasting textures and flavors, all coming together to make it a truly satisfying bite. Watching my guests enjoy these stuffed shells made it worth while standing at the stove for those couple of hours. 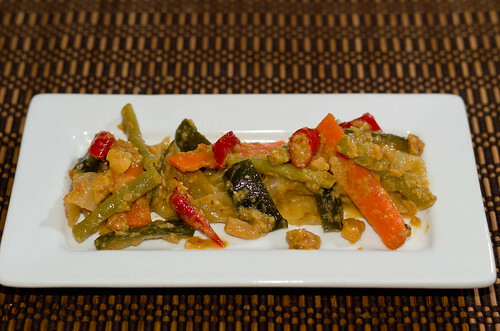 Another dish that I made for the occasion which I had not made in some time was my maternal grandmother’s pickles – Achar Ahwak. Since it was a pickle dish, I had to make it in advance, and the process was quite laborious. I had to salt pieces of sliced cucumber, squeeze the water out, then dry them in the oven for around 1 1/2 hours until the pieces were dry and shriveled. Traditionally, these pieces were placed in the hot sun until the right dried state. Along with the cucumber are pieces of carrot, longbean, red chilies, and large ribbons of cabbage, all parboiled and squeezed dry. The pickling sauce consisted of tons of shallots, a bit of fresh turmeric, dried chili paste, white vinegar, salt, sugar, and a touch of sesame oil. What makes this pickle unique is the addition of a copious amount of crushed Peanut/Sesame Brittle that added the rich nuttiness as well as the necessary sweet element to compensate for the acidity. My grandmother would make a vat full of this and we would scoop a bowl full every night for our dinners until we ran out of it. Similarly, I made a large bowlful, and I’m still enjoying the remnants to this day, weeks after the celebration dinner. It truly was worthwhile and an honor to recreate my grandmother’s dish and to maintain this tradition alive.